Krystal: Free Slushie or Frost! 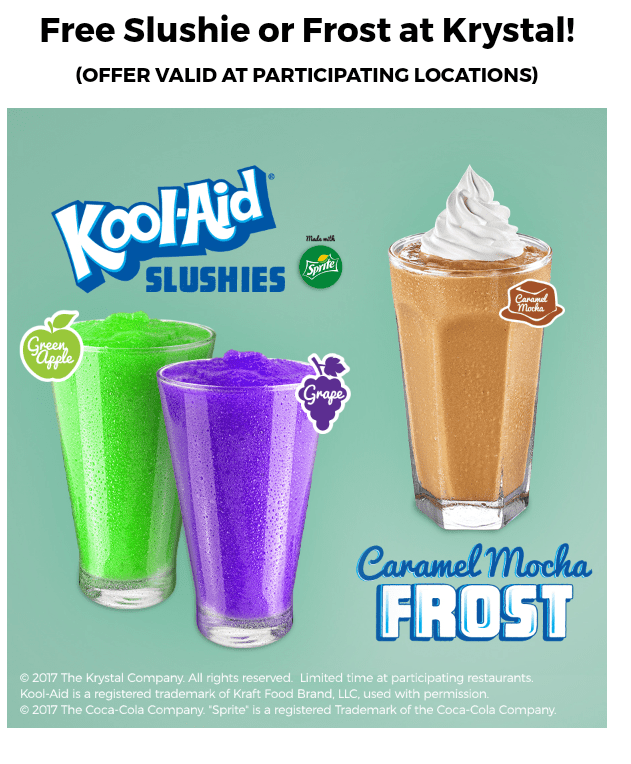 Get a free Kool-Aid Slushie or Caramel Mocha Frost drink at Krystal! Have a Krystal restaurant in your area? Grab your cellphone and text the word: FROST to 35350 follow the prompts. And get a mobile coupon redeemable for a FREE Kool-Aid Slushie or Caramel Mocha Frost drink at participating locations. Then just show your phone at your local Krystal to redeem. Coupon is valid for 5 days from the day you send the text. Click here for the store locator.